Time for another round of Yvo’s Shorties! This time around two authors I’ve read books of before that belong to my all time favorites… Although this time around they didn’t manage to get the highest rating. 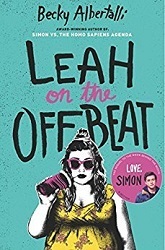 Leah On The Offbeat by Becky Albertalli was definitely the fluffy and feel good read I was looking for. I still prefer Simon, but this one was very entertaining as well. 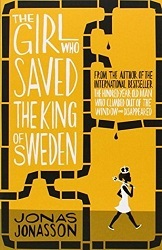 And Jonas Jonasson‘s books seem to be hit and miss for me… I absolutely loved The Hundred Year Old Man, but both other reads (including The Girl Who Saved The King Of Sweden) didn’t hit the mark for me. Simon vs The Homo Sapiens Agenda is definitely one of my all time favorite reads, and as soon as I heard there was going to be a sequel I was jumping up and down out of excitement. Then I started thinking: but how could a sequel ever live up to the first book? Of course there was no way I could keep myself from spending more time with some of my favorite characters though, so I knew I had to pick up Leah On The Offbeat at some point. I’ve heard mixed things about this title ever since it was published, but this didn’t stop me from being curious and wanting to give it a go myself. And while I don’t think it is as good as the original, it does have a love triangle and the main character Leah can get annoying, I do love the diversity in this story. And basically it’s cute, it’s fluffy, it’s lgbt, it has interesting characters and I had a great time reading it. Becky Albertalli is an expert in creating quirky, interesting and well developed contemporary characters and it is exactly those characters that take this story to the next level. Plus, we get a whole lot of Simon and his gang as well! Would I have preferred not having the love triangles? Probably. Could I have done without some of the drama and cliches? Maybe. Did Leah started to get on my nerves at points? Likely. 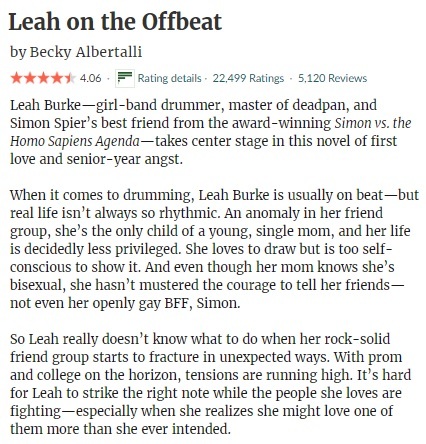 But that doesn’t take away that Leah On The Offbeat was just the cute contemporary read I needed where diversity, quirkiness and uniqueness are not only encouraged but also praised. I read The Hundred-Year-Old Man Who Climbed Out Of The Window And Disappeared back in 2015 and it ended up being on my list of all time favorites ever since. It’s true that Jonas Jonasson‘s dry and sometimes sarcastic humor and writing style in general isn’t for everyone, but if it’s your style you will be blown away by it. I’ve been looking for a repeat experience ever since, but sadly I haven’t been able to. Hitman Anders was a total miss for me, although I still had hope for The Girl Who Saved The King Of Sweden. I tried keeping my expectations low, but still I wasn’t charmed by this one either. Let’s begin with the positive. I do like his writing style and there are definitely some funny moments there. I like how the author incorporated many politically and socially important historical events in his book as a background for the main characters. Nombeko’s history is fascinating and shines a light on the complicated past of South Africa, although it’s not the main goal of the story. 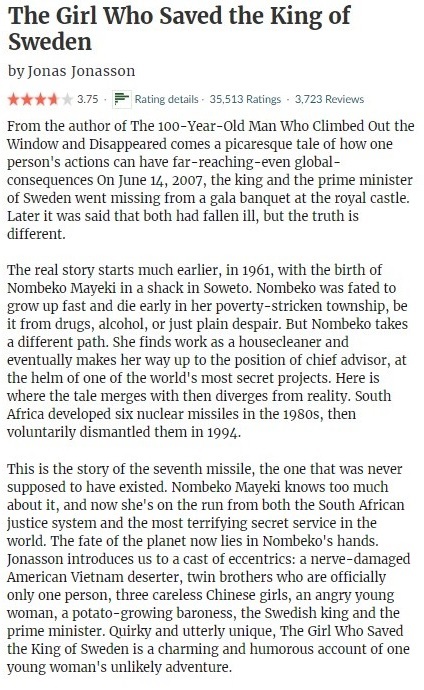 The Girl Who Saved The King Of Sweden has a dual POV structure, where we follow not only Nombeko in South Africa, but also the Swedish Ingmar and later his sons Holger and Holger. I personally wasn’t a fan of the Swedish POV especially in the first half of the book, although I did grow to like Holger Two. Things also improved in the second half as the different storylines merged and the story started to flow better. Still, it was hard to connect to some of the characters and the story did drag considerably at points. It was nice to see how everything did fit together and how small their worlds ended up being, although I don’t think it was exactly credible. I don’t think the story was ment that way in the first time, but it wasn’t the laugh-out-loud funny story I was expecting either. Oh well, maybe the new The Hundred-Year-Old Man sequel will manage to finally blow my socks off again? This entry was posted in 2018, 3 Star Rating, 4 Star Rating, Book Reviews, Yvo's Shorties and tagged 3 star rating, 4 star rating, becky albertalli, book review, contemporary, creekwood, fiction, high school, humor, jonas jonasson, leah on the offbeat, lgbt, love triangle, politics, published in 2013, published in 2018, romance, series, south africa, sweden, the girl who saved the king of sweden, translation, young adult, Yvo's Shorties by Yvo. Bookmark the permalink. I love your quickies, you always make me discover new books! I agree, Leah is a decent read but could have never lived up to Simon! Good to know I wasn’t the only one with those feelings. Fab reviews, Yvo. I have been curious about Leah. Glad you enjoyed it even if it wasn’t quite like Simon. Can’t wait to read it. I guess it helps not setting expectations too high… It was wonderful seeing more of Simon though. Great reviews! 🙂 It’s great that you ended up really enjoy Leah on the Offbeat! It wasn’t a favorite of mine, but I think it was pretty good. I prefer Simon all the way as well, but I guess it was just the right read at the right time for me. Glad to see that Leah on the Offbeat was an enjoyable read despite a few annoyances. I read Simon via audiobook right before the film came out and enjoyed the fluffyness of it despite the fact I typically hate YA contemporary. I do want to pick this one up at some point. YA contemporary isn’t always my thing either, but there are exceptions. 😉 Can you believe I still have to watch the Simon movie?! I love the book though.